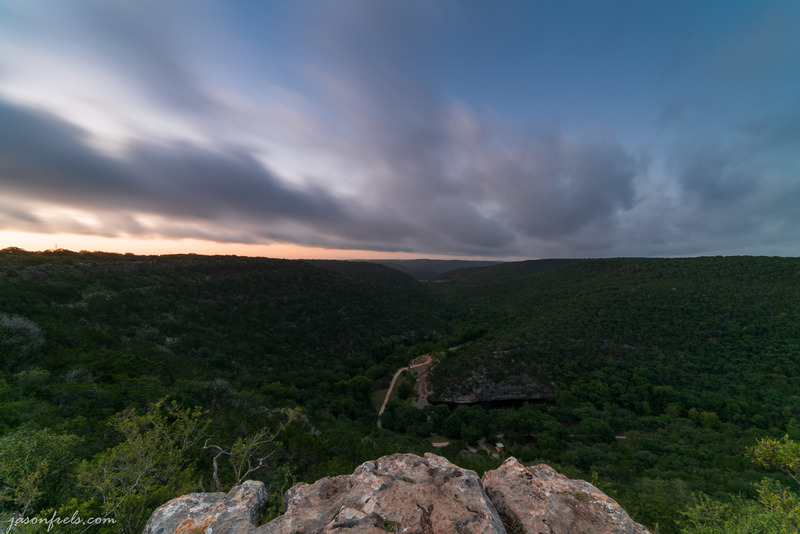 In addition to shooting pictures of the night sky at Lost Maples State Natural Area, I also did a bit of hiking. 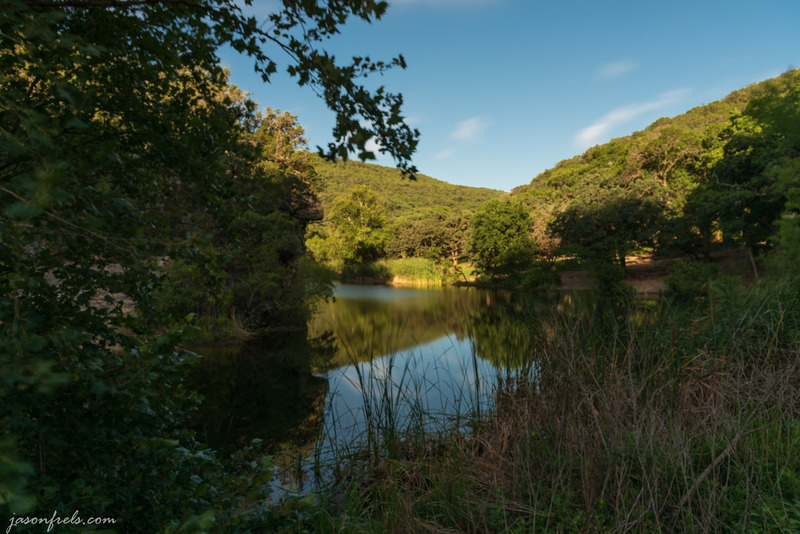 There are many things to do at Lost Maples. I saw people swimming in the water, like one of the ponds shown below. I saw several people birding, as there is apparently a large variety of bird species at the park. There are also a lot of hiking trails. See the trail map below. 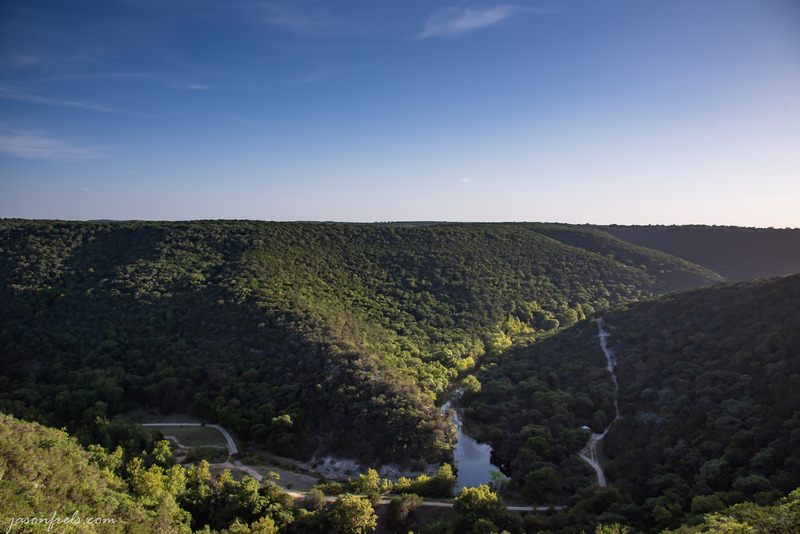 The picture below was taken from an overlook near one of the hiking trails (probably close to the 4 on the map above). It shows a pond, which I have a better picture of later, and some of the trail that lead me up to the top of this ridge. There is also a small waterfall down to the left, but I didn’t climb down to this. This photo was taken just before sunset. This hopefully shows some depth with the side lighting. The next morning I got up before dawn to try to get some good sunrise photos. I set my alarm for about 45 minutes before sunrise the next morning and got up and about. A lot of clouds had moved in over the night and were beginning to work their way out. The below photo is from a ledge looking Southeast. You can see the glow on the horizon and part of the trail below. I worked the above photo in Lightroom pretty hard. I brought the shadows up in the valley a lot while trying to preserve the sky. I loved all of the colors on the horizon and was trying to keep that in the image. I was also on a precarious looking ledge and I was hoping that would add some drama to the image. This was taken using the Rokinon 14mm lens at f/16 and the focus depth is amazing. Look at the rocks in the foreground and the outhouse down in the valley. No focus-stacking required. I was also being assailed by several large black and yellow bumble bees. They didn’t sting me but they continued to buzz around me and annoy the hell out of me. A little bit later, the morning sun was shining on these rocks with warm light. I was also hoping to show some layering down the winding valley with the haze isolating different hills. I had to wait for the sun to come out of the clouds and paint these rocks. There was a yucca down the cliff a bit, but it was surrounded by other growth such that I couldn’t really isolated it. It would have made an excellent foreground for this. The above picture is an HDR merge of about 5 exposures. There was so much contrast between the sky and the valley that I knew I wasn’t capturing everything in one image, so I shot some images for a merge. I didn’t overbake the HDR and I think it is one of my better pictures from this hike. I packed up my camp and made my way back down the ridge. The way down was much easier with gravity on my side. But, the trail is very rocky and I had to be careful to avoid stumbling. 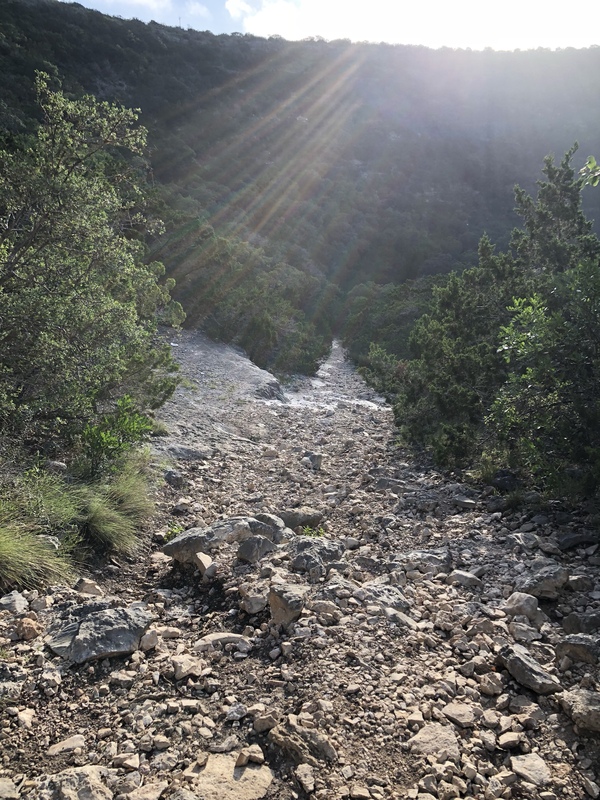 Below is a photo looking down the trail. Shot with iPhone 8 plus. At the bottom of the steep part of this trail is the pond that I mentioned earlier. Below is a picture of the pond shot from down in the weeds about an hour and a half after sunrise. I did a long exposure as I was trying to smooth out the water and get a good reflection of the sky. I couldn’t really get down through all those weeds and I began to worry about snakes. I would have tried to get some better pictures, but at this point my camera battery was starting to die. I went to get my spare camera battery to keep shooting and found that it was no longer in my bag. I searched my backpack and could not find it. I think that it must have fallen out of my bag up on the ridge. I considered going back up there to re-trace my steps, but I decided to just buy another replacement battery for $18. I was pretty tired and frustrated and didn’t want to make the climb again and it was unlikely that I was going to find the battery anyway. I hiked around a bit more on another portion of the East trail, but I don’t have any pictures of that. There were a lot of eponymous maple trees there. I may come back in late Autumn and try to get some colorful photos. 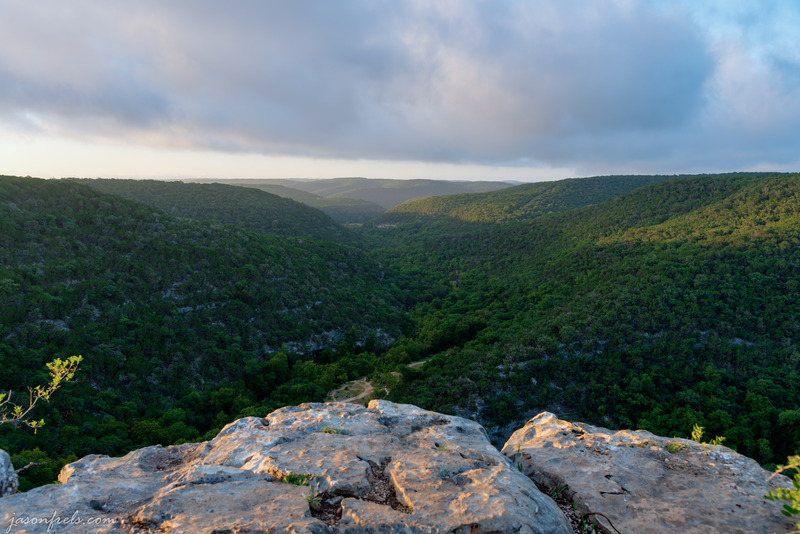 Lost Maples was a great place to hike and camp. I can’t wait to go again. Probably in the fall when it is a tiny bit cooler. It is about 3 hours drive for me, so I can’t go as often as I like. Hope you enjoyed the read. Please leave a comment below. More awesome pictures. I took several pics from the 4 spot but I like the ones you took better. Thanks, I was hoping the pictures at dawn would work out. One of the joys of camping.